Hola … I was thinking about to post this thread from long time (since last 5 months) as I have been extensively involved in a OBIEE 11g platform build from scratch, playing with 3 nodes OBIEE installation , Vertical / horizontal clustering et all. Now the game is over and I want to detail out each and every steps in details and the hurdles I have faced during step by step setup execution. Honestly before writing this blog thread I have searched across web and googling around several sites to get consolidated Clustering steps and I never found it. This is nothing mean to wrong to other blogger who are posting excellent stuff in their blogs since ages but I feel each post on Horizontal Cluster lacks some information on details. There are few restrictions in terms of browser support for this version with IE11. See my previous post for the hack on IE11 to get this work done perfectly. A little background from OBIEE 10g version just to understand why we made decision to go to OBIEE 11g. 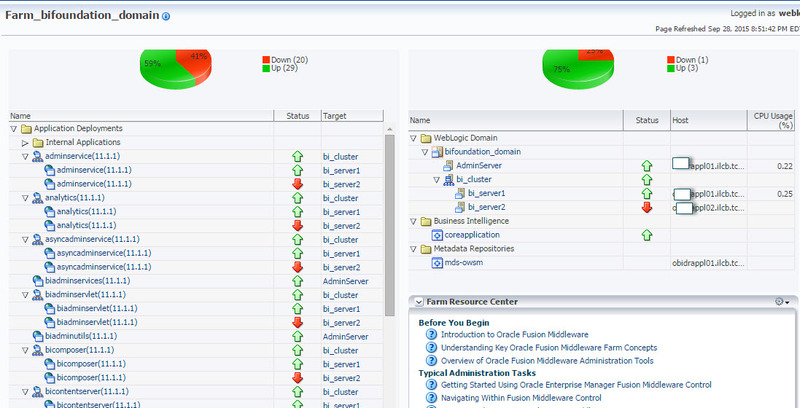 We had 2 OBIEE 10g nodes with 12 instances running on each node is a nightmare to manage and control. Moreover it doesn’t use shared cache with max 4 GB memory address limitation in each sawserver and nqserver process which is a support pain to replenish instances with memory issue/leaks. I will explain the entire things in step by step. In my case it is 2 node cluster installation but for 3rd node the process is exactly same and no difference except extra host to be select on EM. In above customization steps it is NOT required to have the below OS level file changes present as pre-requisite and you can do it later. I assumed that you have right packages downloaded from OTN and right patches before continue. In below steps I am planning to install OBIEE through Unix script using command line parameters so that no GUI is required. I have created my own response file to pass through certain command line steps which will install OBIEE RCU schema first, OBIEE11g and WLS and then perform some 10g ported customization and finally deploy respective catalog/rpd which is updated from 10g. The scope for this thread is to define the Steps required to Horizontal cluster on multi-nodes. To save all Logs into a target file use command : script obiee_installation_log.txt and then start command line execution. Finally once execution done type : exit. this will save entire log from buffer to target file and you can review it to see in details. Execute weblogic command line params to install RCU. This is similar to what we have in GUI. A command line example is below which will drop existing RCU. A command line example is below which will create RCU. Note that rcuPassword.txt could be any file which will act as source file for storing Sysdba User/Password and passed through command line. The reason because RCU schema pre-exist and didn’t clean-up well. You have to find the schema name from below table acts as a RCU version history keeper and then delete those records/commit before proceed. 2. Execute OBIEE installer with response file. 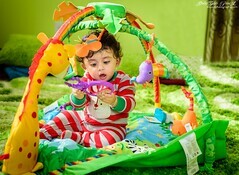 A sample example below: This will be similar like doing Enterprise installation using UI. DATABASE_CONNECTION_STRING_BI, DATABASE_SCHEMA_USER_NAME_BI, DATABASE_SCHEMA_PASSWORD_BI,DATABASE_CONNECTION_STRING_MDS, DATABASE_SCHEMA_USER_NAME_MDS, DATABASE_SCHEMA_PASSWORD_MDS. The installation of Oracle AS Common Toplevel Component, Oracle Business Intelligence Shiphome failed. To avoid this I used to do a tweak and intercept of correcting the opmn.xml while 40% of the installation is over and once you get this file created. This file located at directory : /u00/app/Middleware/instances/instance1/config/OPMN/opmn. 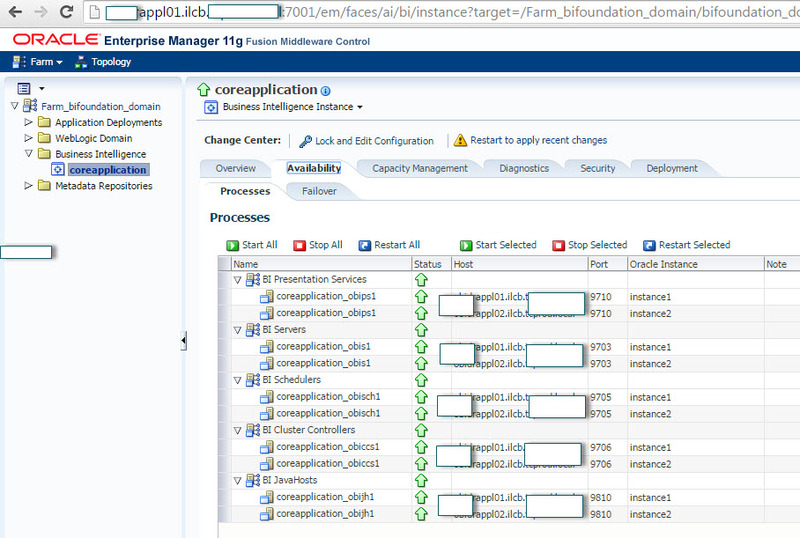 This will make sure Scheduler start-up will be fine and no issue to Proceed the BI Configurations. This is just a hack a no reason why Oracle haven’t done this default in there installation package. You might need to do it across all secondary nodes. The idea is you should be getting below to confirm entire Installation is done successfully. The installation of Oracle AS Common Toplevel Component, Oracle Business Intelligence Shiphome completed successfully. Now we have to scale-out to Node 2 (secondary) and then 3rd node. 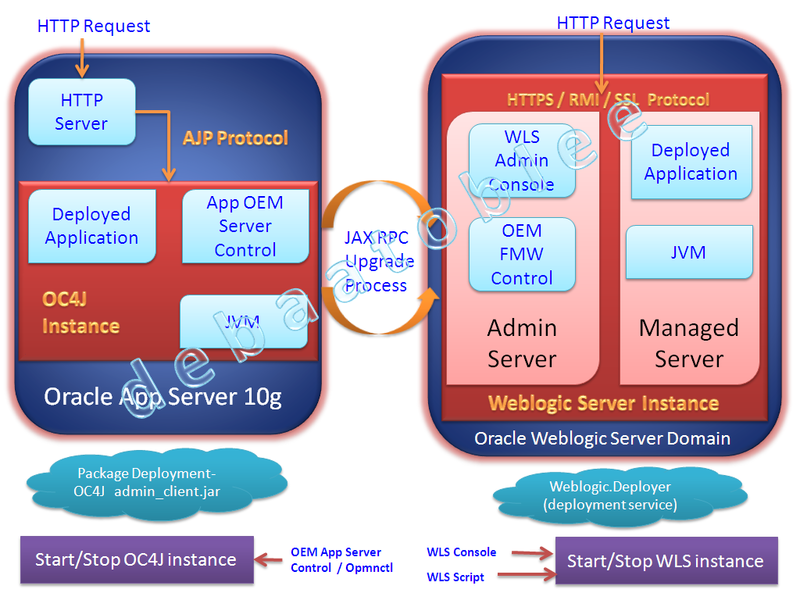 All activities will continue here like installing OBIEE / Weblogic , configuration except Admin server installation. Node 2 installation would be pretty much faster than Node 1. In my experience Primary node takes 30-40 minutes while all secondary nodes will take ~15 minutes to do complete install. Anyway it again vary from system to system based on capacity but I did a tweak on Java memory parameters for faster start-up/shutdown and Installation on OS level. Performance enhancement for faster start-up/Installation. If that works, then “chkconfig rngd on” ( to start it at boot ). Repeat STEP 2 for Node 3 . It must be similar. Lets do a quick sanity check first for Node 1.
top -u orabi should throw below running process on Node 2. We can see Node 1 and 2 added in cluster. this means scale-out is successful and EM recognizes both node. Also you see some of the processes are down on Node 2 from EM which is fine. Now we will see what additional steps we need to do. If you are deploying RPD and Catalog it is recommended to deploy it now into share path (which you must have to do if you want 3 nodes to share the same RPD and Catalog). 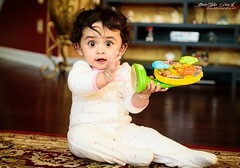 So Go to EM-) Deployment-)Repository. Add new RPD and Catalog after “Lock and Edit”. 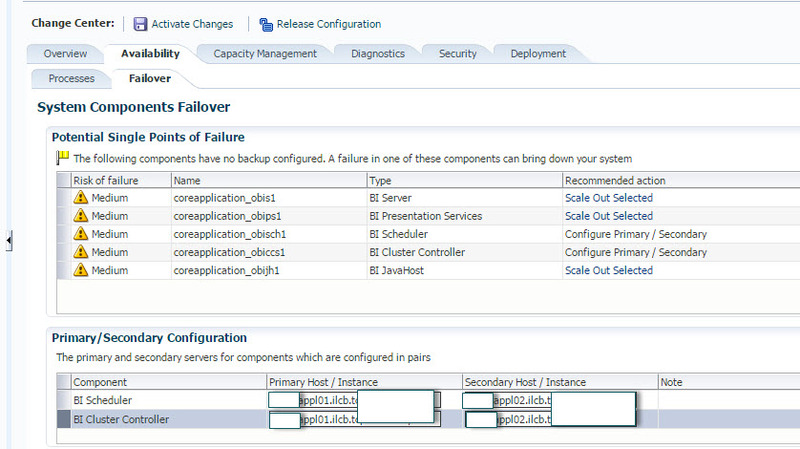 Now “Lock and Edit” and Go to EM-) Availability -) Failover -) Make secondary Host like below and Apply, Activate Changes. Now perform “Restart All” . This will make all the processes up and running across all nodes. But note, we haven’t yet created OBIEE Managed server system components on secondary nodes. Go to Capacity management -) Scalability -) Add one components on each secondary nodes. This is nothing but vertical clustering on horizontal cluster. If you add more than one components it will create more than one instance on single host. Hit “Apply” and “Activate Changes” . It will take some time to create additional processes and start them up on secondary nodes. Once this is done successfully then see the list of running process on secondary node by typing top -u orabi in unix session. And observe below that instance2 system components creates under below location on 2nd node. I have faced several issues with EM not recognizing the new set of components and processes during Restart. In such cases do Individual component restart or try using opmnctl commands to restart opmn managed components else Bounce Primary node at once and then bounce secondary node once. 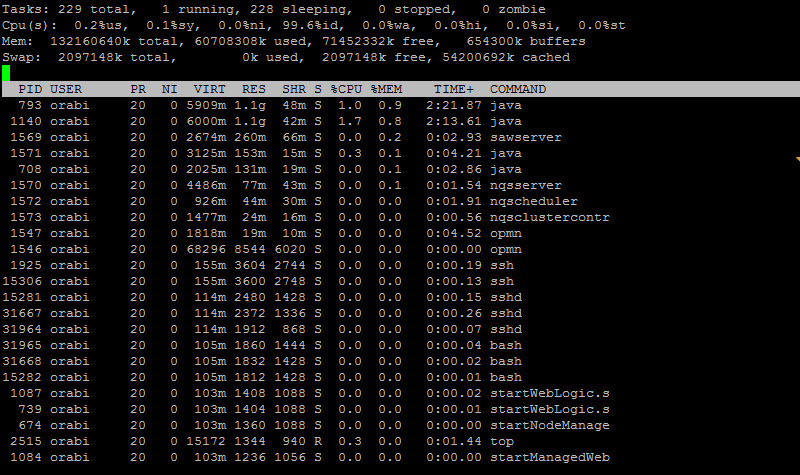 This should resolve most of the problem otherwise it is bigger issue and something wrong during cluster setup process. If you have any customization carried forward from 10g upgrade this is the right time to do that in each nodes one by one starting from Primary. Follow the steps to stop services on Primary and then make customization changes and then start on primary and then stop on secondary , do customization and then start services. This is standard process step by step. Apparently RPD is share under Shared Path but physically RPD located under repository path below under each Nodes and when the opmnctl process starts up it loads the RPD from this physical path. So the concept of Shared RPD applicable when you open RPD in online mode and made some changes the change is reflected online and this location acts as temporary staging location and after changes in RPD become it sync with clustered nodes and propagated the changes. Even in Horizontal cluster mechanism Cache has been create in individual nodes. Global Cache is a concept which is applicable during Cache seeding only and nowhere else. If you want to do Vertical clustering on top of Horizontal its easy from EM. After Clustering you can access Node 1 using its HostName . If Host1 is down you can still access Node 1 as WLS internal clustering/Load balance will automatically route the request to 2nd Node by the help of Clustered Controller module. If 2nd node also not found it will redirect request to 3rd Node. The idea of WLS Horizonal clustering is High availability which tells even if Admin Server is down in Node 1 , clustered managed servers/nodes still can work and serve user query without having any downtime. Don’t try to do Customization on STEP 7 before STEP 6 (EM and Failover changes plus adding instances on secondary nodes) because you might have some customization which require that instances directory to be created first inside Secondary nodes. Entire activities above can be done using Unix scripts only. For e.g, even the Horizontal cluster/ Failover/ scalability can be done using WLS scripting and invoking python script from inside shell script. For me its easy to use EM UI to do this but certainly end to end steps possible through scripts. Scheduler will run only on Node 1(Primary) and Node 2 (Secondary) but it will not run on 3rd Node (Secondary) but scheduler query can run on Node 3. Hello friends, after long time , I am again back on track … I was quite busy with couple of my mandatory schedules for last couple of weeks! So today my topic is what are the Performance tuning key measures useful while doing report Performance testing. There are lots and I just tried to pull most of them and cover the highlights which would be very helpful while doing the Report Performance testing. Actually this could be separated across several areas like sometime it would be from DB perspective, sometime Environment parameters and sometime it would be the Repository design perspective. However the target objective is same but we need to work well to understand the performance bottleneck from which angles! This will definitely come with the experience and the different challenging environment and every places different rules needs to be applied. RAC/Cluster / Grid based in NAS and SAN storage – This is recommended in Enterprise Architecture Platform with robust and performance resilient framework. Exadata / Greenplum Architecture – For high performance and high throughput the database Architecture should be robust and especially when there lot of in memory operations intended for better performance especially for transactional analysis. Memory SGA/PGA/Buffer Cache/ Temp, Undo, Redo tablespaces should be optimized using the best practice guided suitable for the underlying hardware. Partitioning is very important and key areas to get most effective performance benefit as most of the analysis involve the time dimension. Gather Statistics or analyze 30% sample of table at-least for Cost Based Optimizer to use, otherwise Rule Based Optimizer will be used . Oracle recommendation to use DBMS_STATS.AUTO_SAMPLE_SIZE for fastest gathering of stats. Multinode Clustering – Horizontal/Vertical scale-out in terms of multiple Admin and Managed Server in Weblogic domain. Leveraging BI Server Caching to get most benefits out of the Cached queries and return the same result without hitting the database multiple times. Switch off Usage Tracking to avoid extra DB operations running against each query. Limit the number of Initialization blocks to avoid the login performance degradation. However this feature improved in 11g to allow the database query fired once when that corresponding Values referred by Init block hitted. Setting the query limit for a certain number of records and certain time window helps performance improvement for long running Ad-hoc analysis. Turn off higher Query log level to avoid File system IO based operations and performance degradation. Aggregated Tables /Mviews – Follow this approach if there are huge volume of data in detail fact table. Multi-level aggregated table based design return best results. An error occurred during authentication. The below error has been thrown in Presentation Service Log. 2010-12-08T13:45:07.000-05:00] [OBIPS] [ERROR:10]  [saw.security.odbcuserpopulationimpl.initialize] [ecid: ] [tid: ] Odbc driver returned an error (SQLDriverConnectW). The issue is there in the Host machine configuration with no static IP pre configured .Below steps would help . 1) Add the IP Address of the machine and the full domain name next to it if your machine is part of the domain. 3) Restart the services and try again.This would resolves the problem .